Thanks for this review Jenny. I am definitely going to give it a try with my students next term! Wow Jenny, I didn’t know about this tool, it is fabulous! What uses we will have for it with our classes. Thankyou for this post-it was very enlightening! 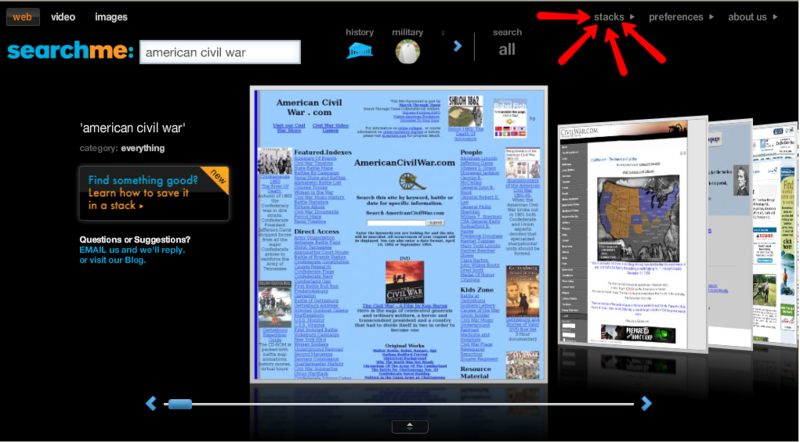 I have just begun introducing SearchMe and Viewzi to staff and students but they all really like these two search engines. They like being able to use the visual aspects, the videos views have been especially well received. We have found that the searches have turned up good (relevant and useful) material. Thanks Jenny, you have reminded me to return to Search me and have another go at it. I really need to explore it a bit better as the last time I tried it seemed to give me lots of irrelevant stuff. But that was probably more my fault rather than the fault of the search engine. I haven’t heard of Mahalo so that is the next learning journey. Thanks for sharing this great search engine. I am going to try and advertise this with our students. It is very impressive and easy to use. I’m so glad all of you have left comments letting me know that you think Searchme is worth exploring with our students. I’ve been showing some senior students Searchme today and they have been so impressed. One comment was ‘Why would you go back to Google’. She loved the visual interface and being able to see the page straight up. I’ll be interested to observe their search patterns when they’re not being prompted to use it; will they defer to what they know and the ‘brand’ that Google is? Thanks Jenny! My school was thinking of subscribing to NoodleTools this year, but wonder if Searchme and Viewzi will work instead? In addition? @Anne -I had not heard of NoodleTools before. I’ve had a quick look at their website but haven’t done a thorough enough investigation to make comment. My feeling about subscribing to a service is that it’s fine if you can get widespread adoption, but it’s not such good use of money if it doesn’t get used (despite your best efforts at plugging the service). These are questions we are asking in our library re subscriptions to databases. Jenny, I have just read your post and looked at Searchme. I hadn’t seen it before and I love the idea of the stacks. I’ll get my head around it first before I introduce it to my Year 4’s. Will have a closer look at Viewzi later. Previous PostPrevious Passing the time with Sheryl, Chris, Wes, Kevin and Dean. Next PostNext Rising Generations impress.